Any substance which can be metabolized by an organism to provide useful chemical energy and build tissue; components of food which fall into the general categories: carbohydrates, lipids, proteins, nucleic acids, vitamins and minerals. The chemical processes occurring within a living cell or organism that are necessary for the maintenance of life. In metabolism some substances are broken down to yield energy for vital processes while other substances, necessary for life, are synthesized. A nucleotide [C10H16N5O13P3] which contains the purine adenine, a pentose sugar (ribose or deoxyribose) and three high-energy phosphate groups; the potential chemical energy in the bonds connecting the phosphate groups is used to transport energy within cells for biochemical processes (including muscle contraction and enzymatic metabolism) through its hydrolysis; the mitochondrion is the primary cell organelle synthesizing this compound using energy derived from the final oxidation of nutrient molecules. The metabolic breakdown of complex molecules into simpler ones, resulting in a release of energy. These are the breakdown reactions of metabolism and are exergonic/exothermic; they may or may not yield an output of useful chemical energy. The phase of metabolism in which simple substances are synthesized into the complex materials of living tissue. These are the synthetic reactions of metabolism and are endergonic/endothermic; they require an input of useful chemical energy. The rate at which energy is used by an individual at complete rest, measured by the heat given off per unit time, and expressed as the calories released per kilogram of body weight or per square meter of body surface per hour; it is regulated by thyroid hormones (T3 and T4) and epinephrine. The series of linked enzyme catalyzed steps by which the 6-carbon monosaccharide glucose is broken down into smaller molecules with the production of some useful chemical energy for the cell; it follows two major routes: (1) anaerobic fermentation in which one glucose yields two lactate molecules and 2ATPS; this reaction, anaerobic glycolysis, occurs in the cytoplasm of cells, and (2) aerobic cellular respiration in which one glucose yields 6 carbon dioxide molecules, 12 water molecules and a maximum of 38 ATPSs; this reaction, glycolysis, begins in the cytoplasm but continues in the mitochondria (pyruvate decaroxylation, citric acid cycle, electron transport system, and oxidative phosphorylation). The anabolic synthesis of glycogen (animal starch) from glucose monomers using ATP energy which occurs primarily in hepatocytes and skeletal muscle cells; it is encouraged by insulin during the absorptive state. The first and cytoplasmic portion of glucose catabolism in which glucose is converted in a series of linked enzyme catalyzed steps to pyruvic acid and useful chemical energy (net gain 2 ATPs under anaerobic conditions or net gain 2 ATPs and 2 NADH2's under aerobic conditions); techically, either route is considered anaerobic because no molecular O2 is required in any of the steps. The formation of "new" glucose, especially by the liver, primarily during the postabsorptive state, from noncarbohydrate sources, such as pyruvate, amino acids and the glycerol portion of fats; this process is stimulated by those hormones termed "insulin antagonists," which includes glucagon, human growth hormone, and the glucocorticoids. The anabolic synthesis of neutral fats (triglycerides) or other lipids from a variety of precursor nutrients including other fats, carbohydrates, or proteins; it is one of the major functions of adipocytes and one of the many functions of hepatocytes. The hydrolysis of lipids which may lead to fat catabolism which will result in a release of useful chemical energy; this process is stimulated by those hormones termed insulin antagonists, which includes glucagon, human growth hormone, and the glucocorticoids; it occurs primarily during the postabsorptive state. Describe: the relationship between catabolic pathways and anabolic pathways in metabolism. Catabolic pathways consist of reactions in which larger molecules are chemically broken apart into smaller component molecules. Catabolic pathways may require an input of energy of activation to get them started, but they are exothermic and exergonic, which means they liberate energy in one form or another as one of the products of the reaction. Some catabolic pathways yield useful chemical energy in the form of ATP or its equivalents or energetic electrons (with associated hydrogen ions) carried by specific electron transport compounds such as NAD+ and FAD+. Those catabolic pathways which liberate useful chemical energy may be coupled to anabolic pathways in order to transfer the useful chemical energy to drive the anabolic reaction. Anabolic pathways consist of reactions in which smaller component molecules are chemically joined together to make larger molecules. Anabolic pathways require considerable input of external chemical energy in order to form the bonds which link the component molecules. They are termed endothermic and endergonic for this reason. Describe: the relationship between useful chemical energy and waste heat energy in metabolic reactions. All chemical reactions involve the making and breaking of chemical bonds. The total amount of chemical energy in the reactants will not be the same as the total amount of chemical energy in the products. Even spontaneous reactions generally require some external source of energy of activation to initiate the reaction. All reactions are less than 100% efficient in energy usage and transfer and, therefore, all reactions lose some energy in the form of random molecular movement which is defined as "waste heat." In a subset of those reactions which can be termed catabolic, exothermic and exergonic, some of the energy is transferred to another form, other than waste heat. This energy may be mechanical energy of motion, creation of a voltage potential, or the storage of chemical energy in the chemical bonds of some compound. In some cases, that chemical energy is then able to be used in coupled reactions to drive other reactions. Examples of product molecules which retain this sort of useful chemical energy include ATP, NADH+ + H+ and FADH+.+ H+. 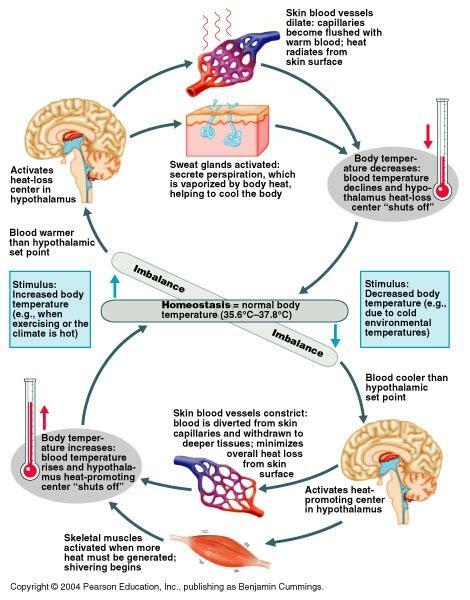 The maintenance of a constant internal body temperature independent from the environmental temperature; the skin, sweat glands, subcutaneous adipose tissue, and dermal capillary beds lay important roles in thermoregulation. The generation or production of heat, especially by physiological and metabolic processes such as increased basal metabolic rate (BMR); these processes are regulated by thyroid hormones (T3 and T4), and epinephrine, and by shivering which is regulated by the CNS. A center in the anterior portion of the hypothalamus of the brain, where there are neurons sensitive to temperature changes reported by sensory thermoreceptors located in the skin, mucous membranes, circulatory system and the brain itself, which regulates body temperature; it works in conjunction with other hypothalamic, autonomic and higher nervous thermoregulatory centers to keep the core temperature constant; some of these thermoregulatory responses are involuntary, mediated by the autonomic nervous system, some are neurohormonal and others are semi-voluntary or voluntary behavioral responses. (1) amines: thyroxine = tetraiodothyronine = T4 and triiodothyronine = T3 which are produced by follicular cells in response to TSH and target most cells in the body to increase their cellular metabolism, a thermogenic effect; and (2) protein: (thyro)calcitonin produced by the autoregulated parafollicular = C cells released in response to increases in plasma calcium ion levels which targets osteoblasts to increase formation of bone matrix causing a corresponding decrease in plasma calcium and phosphate ion levels. Any decrease in the diameter of blood vessels due to the contraction of the smooth muscle in the vessel's walls; usually regulated by the autonomic NS and certain hormones. The generation or production of heat by physiological and metabolic activities which increase the basal metabolic rate (BMR); this is regulated by the hypothalamus which stimulates the release of (1) TSH from the anterior pituitary in order to increase output of T3 and T4 from the thyroid gland and the release of (2) epinephrine from the adrenal medulla. generation or production of heat by stimulating involuntary uncoordinated contractions of the skeletal muscles which is regulated by a shivering center in the hypothalamus which then activates motor centers in the brain stem; these contractions require catabolism of nutrients for energy production which provide most of the heat production. A increase in the diameter of the superficial blood vessels supplying the capillary beds of the dermis of the skin due to the contraction of the smooth muscle in the vessels' walls; usually regulated by the autonomic NS and certain hormones; it increases blood flow in the skin and typically increases heat transfer to a cool environment. A decrease in the diameter of the superficial blood vessels supplying the capillary beds of the dermis of the skin due to the contraction of the smooth muscle in the vessels' walls; usually regulated by the autonomic NS and certain hormones; it reduces blood flow and heat transfer to the environment; heat loss from a human is reduced when arms and legs cool to several degrees below the temperature of the body core, where most vital organs are located. 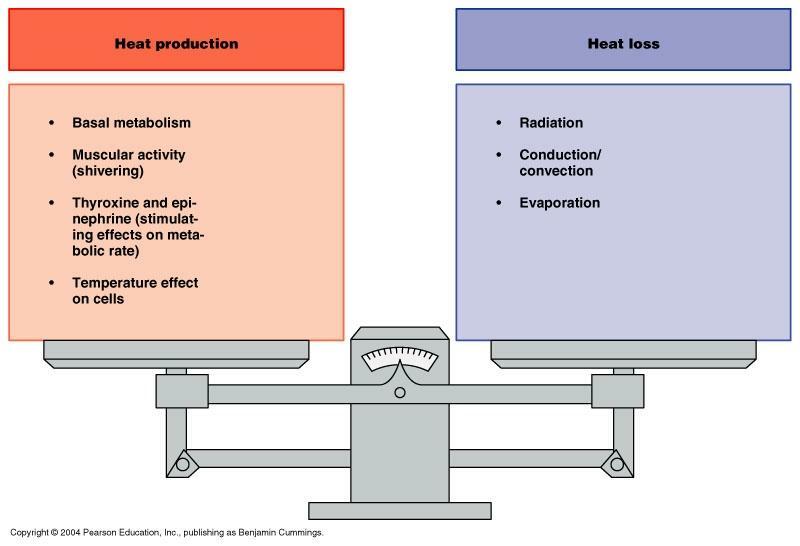 The propagation of energy through space; the emission of energy in the form of particles or electromagnetic rays or waves; in the case of thermoregulation, the conversion of body heat into infrared rays which are transmitted away from the body. The transmission of something through a medium or passage, especially the transmission of electric charge or heat through a conducting medium without perceptible motion of the medium itself; the direct transfer of thermal motion (heat) between molecules in direct contact with each other; heat is always conducted from an object of higher temperature to one of lower temperature; however, the rate and amount of heat transfer varies with different materials; water is 50 to 100 times more effective than air in conducting heat. Heat transfer in a gas or liquid by the circulation of currents from one region to another; the transfer of heat by the movement of air or liquid within the medium or past a surface; it is caused by the molecular motion; it occurs when a breeze contributes to heat loss from the surface of an animal with dry skin; it also occurs when circulating blood moves heat from an animal’s warm body core to the cooler extremities such as legs. A rise in the temperature of the body above the normal range; frequently a symptom of infection; stimulated by various chemicals, some of which are present in microorganisms (exogenous pyrogens) while others are internal local hormones released by immune system cells (endogenous pyrogens). A substance that produces fever; various chemicals with this property are known, some of which are present in microorganisms (exogenous pyrogens) while others are internal local hormones released by immune system cells (endogenous pyrogens); the major endogenous pyrogen in humans is probably interleukin-1. A sensation of coldness, often accompanied by shivering and pallor of the skin, a pinched face, and blue lips, caused by undue cooling of the body or by nervous excitement, or forming the precursor of some constitutional disturbance, e.g., a fever; often an early symptom of infectious disease due to the invasion of the body by toxins; to be seized with cold. An abnormally low body temperature, due to exposure to cold weather, or immersion in cold water, or induced by medical means to decrease the metabolism of tissues and, thereby, the need for oxygen, during certain surgical procedures, especially on the heart. A severe condition caused by impairment of the body's thermoregulatory abilities, resulting from prolonged exposure to excessive heat and characterized by cessation of sweating, severe headache, high fever, hot dry skin, and in serious cases collapse and coma. An abnormally high body temperature, due to high fever, over exposure to the sun and heat stroke, burns, severe viral infections, bacterial septicemia and certain toxins, thyrotoxic crisis, as an undesirable side effect of certain drugs used in general anesthesia (anesthetics and muscle relaxants), etc., or induced for therapeutic purposes. List: the systems and control factors involved in negative feedback regulation of body temperature. List ways the body produces heat. List ways the body conserves heat. List ways the body loses heat to the environment. Those building blocks, i.e., monomers (amino acids), of proteins, which are mandatory for normal growth and development but cannot be synthesized or are synthesized too slowly for normal requirements; therefore, these essential amino acids must be obtained from the diet; the group includes: histidine, isoleucine, leucine, lysine, methionine, phenylalanine, threonine, tryptophan, and valine. Various inorganic substances, usually individual elements in the form of ions, which constitute about 4% of the total body weight; they are concentrated most densely in the skeleton; they can be divided into two categories: (1) those present in relatively large amounts, e.g., sodium, potassium, calcium, magnesium, chlorine, phosphorous, and sulphur, and (2) trace elements - those present at a concentration of less than 50mg/kg, e.g., selenium; some are also considered "essential," i.e., those essential to growth or health, e.g. sodium and selenium; they may interact with each other on a variety of levels: (1) as co-factors in enzymes, they modulate the substrate/product relationship of biochemical pathways, (2) as ions across membranes, they contribute to: (a) the state of electrical excitability, e.g., the action potential, (b) the distribution of fluid volumes between fluid compartments, (c) competitive interactions, e.g., of zinc and copper for intestinal absorption, and (d) as common targets for regulatory compounds, e.g., vitamin D's action on calcium, phosphate and magnesium. Any of various fat-soluble or water-soluble organic substances essential in minute amounts for normal growth and activity of the body and obtained naturally from plant and animal foods; most vitamins, or their immediate metabolic derivatives, serve as co-enzymes or co-factors in a variety of enzyme catalyzed metabolic reactions; since they are recycled many times in these reactions before becoming useless, only small quantities are required by the body to replace those lost in each period of time. One of the four oil-soluble [aliphatic alcohol] vitamins, occurring in nature in two forms: retinol and dehydroretinol; it is found in fish liver oils, liver, butter, egg yolk, cheese and most yellow and orange fruits and vegetables, in most of which it exists in its precursor form, carotene; in the developing world, most vitamin A comes from vegetable sources whereas in the developed world, animal sources are the main dietary source; Vitamin A is formed from carotene (and other provitamins) in the small intestine; bile salts and fat are required for its absorption; after absorption, vitamin A is transported in chylomicrons to the liver, where it is either stored as an ester, or re-exported to critical tissue sites in combination with retinol binding protein; vitamin A is necessary for the normal growth of epithelial tissue, aids in the synthesis of polysaccharides, is essential for formation of the visual pigment, rhodopsin, and it may have a role in protection against degenerative and neoplastic tissue changes. A range of water-soluble vitamins with little structural similarity; they are grouped together because (1) they all act as coenzymes which participate in various metabolic reactions, and (2) they all tend to assimilate together in similar foods, e.g., milk and cereals; the group includes: vitamin B1 - thiamine, vitamin B2 - riboflavin, vitamin B6 - pyridoxine, vitamin B12 - cyanocobalamin, niacin, pantothenic acid, folate, and biotin. A small, water soluble organic compound, ascorbic acid, which promotes many metabolic reactions, particularly the laying down of collagen during the formation of connective tissue; it does this by facilitating the activity of enzymes which hydroxylate lysine, proline and procollagen; hence, it promotes wound healing; it also has vital roles in maintaining folate as tetrahydrofolate and in the absorption of iron; sources of vitamin C include citrus fruits, tomatoes, green vegetables, kidney, liver and milk; cooking of these source reduces the vitamin C content by virtue of oxidation and absorption into the cooking water; absorption takes place within the ileum by secondary active transport along with sodium ions; vitamin C deficiency produces classical scurvy, a condition characterized by general weakness, anemia, gum disease (gingivitis), and skin hemorrhages, scurvy is now most frequently seen in older, malnourished adults and is very rare in developed countries; Vitamin C status is determined from an assay on white blood cells. aka - ascorbic acid. One of the four oil-soluble vitamins; a collective term for a range of oil- or fat-soluble compounds (e.g., vitamin D2 = ergocalciferol, pro-vitamin D3 = 7-dehydrocholesterol, vitamin D3 = cholecalciferol, 25-hydroxycholecalciferol = 25-HCC = calcidiol, 1,25-dihydroxycholecalciferol = 1,25-DHCC = calcitriol) with similar activity on calcium and phosphate physiology: (1) the enhancement of gastrointestinal absorption and (2) an increase in mineral deposition in bone, in nature, cholecalciferol is supplied principally through the action of ultraviolet light on skin; there are very few natural foods which contain substantial amounts of vitamin D in either the D2 or D3 form - they include fish-liver oils, egg yolk and fortified milk, margarines and breakfast cereals; ergosterol within plant matter can be converted to vitamin D; the consequences of vitamin D deficiency are (1) lowered blood levels of calcium and phosphate producing a secondary hyperparathyroidism in response, and (2) a further reduction in phosphate levels and increased plasma levels of bone-derived alkaline phosphatase; clinically, these produce poor bone mineralisation - rickets in children, osteomalacia in adults; depending on the cause, there may be a rapid response to administration of small doses of calciferol. One of the four oil-soluble vitamins, an oil- or fat-soluble dietary vitamin necessary for normal reproduction, muscular development, resistance of erythrocytes to hemolysis, and various other biochemical functions in humans and animals; also, it can act as an antioxidant; a collective term for a range of eight naturally occurring oil- or fat-soluble compounds (the tocopherols and tocotrienols, of which, d-alpha-tocopherol is the most widely available and the most biologically active); sources of vitamin E include fresh nuts, wheat germ seed oils, and green leafy vegetables; animal products are generally poor sources; absorption depends on the digestion and absorption of fat; free tocopherols passively enter the lymphatic circulation, whereas metabolites and a small amount of vitamin E enter the portal circulation; when circulating in the blood, it is principally bound to low-density and high-density lipoprotein (LDL and HDL); it is stored in the liver, adipose tissue, muscle, pituitary gland, testes and adrenals. One of the four oil-soluble vitamins; a collective term for a range of oil- or fat-soluble organic compounds: (1) vitamin K1 = the phylloquinones, present in green vegetables and fruit, and (2) vitamin K2 = the menaquinones, synthesized by bacteria within the gut; vitamin K plays an essential role in blood clotting by acting as a cofactor for the post-translational carboxylation of glutamate residues in clotting factors II (prothrombin), VII, IX and X by the liver; bile salts and fat are required for its absorption, and triglyceride-rich lipoproteins (VLDLs) seem to be the major carriers of vitamin K in the plasma; it is stored in the liver and spleen; dietary sources include leafy vegetables such as spinach, cabbage and cauliflower, certain legumes, and some vegetable oils such as rapeseed and soyabean oils. Describe: the relationship between deamination of amino acids and the formation of urea in the liver. The liver has the major responsibility for maintaining the appropriate levels of the approximately twenty amino acids required by the body for protein synthesis and other functions. When a particular amino acid is present in the liver in excess of body needs, it may be transformed into some other needed amino acid by the process of transamination or it may be catabolized for energy by the process of deamination. 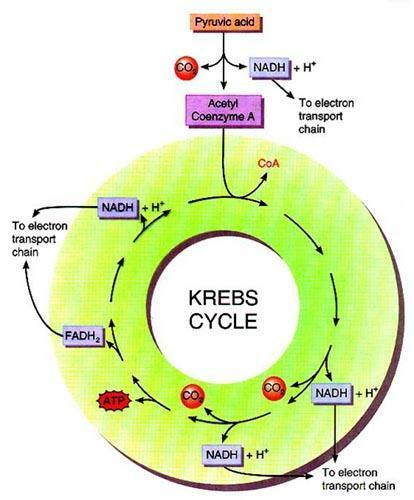 It is necessary to remove all the -NH2 amino groups from the amino acid so that the remaining carbon "skeletons" can by transferred to one or another of the central carbohydrate catabolic pathways, glycolysis or the Kreb's Cycle = TCA Cycle = Citric Acid Cycle. The amino groups cannot be further broken down for any useful chemical energy, and if left as is, would spontaneously combine with water to for a dangerous strong base, ammonium hydroxide NH4OH. To prevent that outcome, enzymes in the liver immediately combine any amino groups generated from protein or nucleic acid catabolism or any ammonium ions absorbed from the large intestine which were by-products of normal flora bacterial metabolism with carbon dioxide molecules to produce a safe, highly water-soluble non-toxic nitrogenous waste compound, urea, which can be transported safely in the blood plasma to the kidneys for excretion. This reaction is 2CO2 + NH3 Û urea. 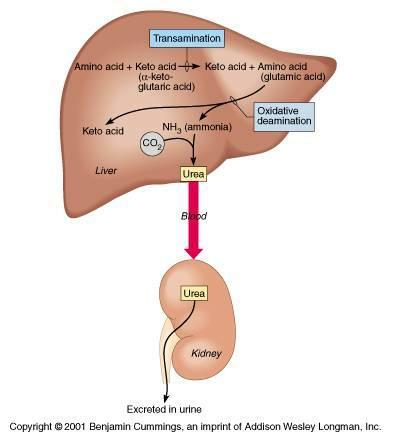 Diagram: the relationship between deamination of amino acids and the formation of urea in the liver. Vitamin A: Excess amounts accumulate and can be toxic. Too much A can blur vision, cause headaches and vomiting, and also lead to liver, bone and central nervous system problems, among others. Beta Carotene: The body converts this into vitamin A. One study found that high levels of beta carotene in the blood were linked to three times the risk of aggressive prostate cancer. Vitamin C: There's no conclusive evidence that it prevents colds, heart disease, cataracts or cancer. Vitamin E: Large doses can thin the blood and may increase the risk of hemorrhagic stroke in those with uncontrolled blood pressure. Has not been proven to protect the heart or prevent cancer. Selenium: Most Americans get enough of this trace mineral in their diet. One study suggests that adding more via a pill may increase the risk of developing type 2 diabetes. Folic Acid: It's a must during pregnancy to help prevent birth defects, but recent studies show no real effect for the rest of us against heart disease, cancer or depression. The connection between folate and reduced risk of Alzheimer's is not yet conclusive either. Niacin: This B vitamin can be used to treat high cholesterol, but only under a doctor's supervision due to the risk of potentially serious side effects, including liver damage. A repetitive series of enzymatic reactions occurring in the matrix of the mitochondria involving oxidative metabolism of acetyl grouped, provided by the production of Acetyl CoA from the decarboxylattion of pyruvate molecules to produce high-energy phosphate compounds (GTPs) or electron transport compounds (NADs and FADs) capable of transferring energetic electrons and hydrogen ions to the electron transport system to produce high-energy phosphate compounds (GTPs); the products of this pathway are a major source of cellular energy. aka - tricarboxylic acid cycle. The 3-carbon end product of aerobic glycolysis which can be transferred from the cell cytoplasm to the matrix of the mitochondria to enter the citric acid cycle, which can use the molecule as a nutrient source for additional energy production. The 3-carbon end product of anaerobic glycolysis (fermentation of pyruvate) which must leave the muscle cell and travel to the liver, heart, or kidneys, which can use the molecule as a nutrient source for additional energy production; the liver is also capable of reconverting this molecule into glucose or glycogen. A metobolic intermediary compound consisting of the 2-carbon acetate group covalently joined to the carrier CoEnzyme A; it carries acetate groups from the decarboxylation of pyruvate molecules or from the beta oxidation of fatty acids or from the deamination of amino acids to enter the citric acid cycle in the matrix of the mitochondria to produce useful chemical energy; this compound can also serve as a building block for the synthesis of fatty acids, amino acids, glucose, and other organic molecules in the cell. 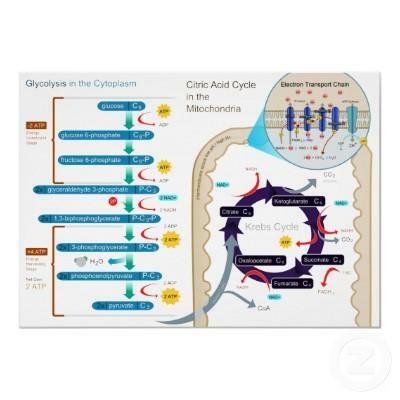 List: the four stages of glucose catabolism and where they occur within the cell. SKetch and Label:the structure of a mitochondrion. Show where the four stages of glucose catabolism occur relative to the structure of the mitochondrion. Describe: the fate of pyruvate under (a) anaerobic and (b) aerobic conditions in the cell in terms of the final end (waste) products and useful energy harvest (ATP production). An intermediary metabolite and a structural component of many biologically important lipids including neutral fats (mono-, di-, and tri-glycerides) and phospholipids; it consists of a 3 carbon frame to which three hydroxyl groups (-OH) are attached, making it a triatomic alcohol. The metabolic production of ketone bodies (acetone, acetoacetate, and beta-hydroxybutyrate) which are byproducts of fatty acid catabolism; they may accumulate in excess in the blood and urine of uncontrolled or out-of-control diabetics because the majority of cells in their bodies are unable to utilize glucose for fuel despite its presence. An acidosis (an abnormal increase in the acidity, i.e., hydrogen ion concentration, in the body fluids) with an accumulation of ketone bodies (acetone, acetoacetate, and beta-hydroxybutyrate); it occurs primarily in untreated or out-of-control diabetes mellitus or in starvation as a byproduct of increased fatty acid catabolism. Any abnormal increase in the acidity of the body's fluids (with a corresponding drop in the pH), caused either by the accumulation of acids (increase in hydrogen ions) or by depletion of bicarbonate ions which serve as buffers; there are a variety of specific causes which fall into two main groups, respiratory and metabolic. class of small diameter soluble lipid-protein complexes which the highest in density (mass to volume ratio); their composition is ~45% apolipoproteins, ~25% cholesterol, and ~30% triglycerides and phospholipids; their normal role is to transport cholesterol and other lipids from the tissues to the liver for disposal; elevated levels of HDL are associated with decreased risk of cardiovascular disease. List: 4 types of lipoproteins and their functions. Sketch and Label: a simplified diagram of the structure of a lipoprotein. 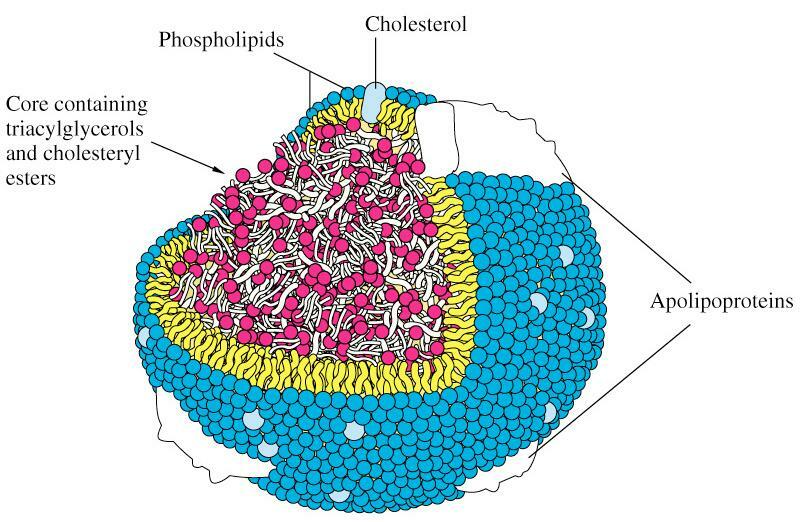 The main points to note for the exam are these: (1) Any lipoprotein consists of an inner hydrophobic core and an outer layer of amphipathic molecules, one molecule thick, which serves to emulsify the lipoprotein droplet in the water of the body fluids; (2) the outer layer consists primarily of phospholipids and free cholesterol molecules and a smaller number of characteristic proteins called apolipoproteins; (3) the inner core consists of large quantities of hydrophobic lipids, neutral fats = triglycerides and cholesterol esters; (4) the differences among the different classes of lipoproteins consist primarily of differences in the proportions of lipids in the core as well as some differences in the apolipoproteins present in the outer layer. (1) a process not depending on free oxygen or air, e.g., anaerobic glycolysis; (2) living or occurring only in the absence of oxygen, e.g., anaerobic bacteria. (1) a process depending on free oxygen or air, e.g., aerobic glycolysis; (2) involving or improving oxygen consumption by the body, e.g., aerobic exercise; (3) living or occurring only in the presence of oxygen, e.g., aerobic bacteria. Any chemical reaction in which the atoms in an element lose electrons and the valence of the element is correspondingly increased; the products of such reactions tend to have less potential chemical energy; often, but not always, the loss of electrons is caused by the addition of an oxygen atom to the molecule; they always occur coupled to reduction reactions. Any chemical reaction in which one or more hydrogens is combined with a compound or in which one or more oxygens is removed from a compound; is such reactions, there is a decrease in the positive valence or an increase in negative valence by the gaining of electrons; the products of such reactions tend to have more potential chemical energy; they always occur coupled to oxidation reactions. Any pair of coupled chemical reactions, one an oxidation and the other a reduction, in which one or more electrons are transferred from one atom or molecule to another atom or molecule, changing the oxidation number (valence) of both; the electron donor becomes oxidized and its oxidation number (valence) increases; the electron acceptor becomes reduced and its oxidation number (valence) decreases; energy is transferred in the process from the oxidized compound, the electron donor, to the reduced compound, the electon acceptor. Nickname - redox reactions. A diverse group of biological oxidation reactions in which one or more hydrogen ions or protons are removed from a molecule along with the removal of useful chemical energy in the form of energetic electrons which will be transferred to some other molecule(s) in a coupled reduction reaction; these reactions are usually catalyzed by dehydrogenase enzymes; in living organisms, cellular respiration is actually a process of oxidation of nutrients wherein some steps involve dehydrogenation. A diverse group of intermediary compounds, often coenzymes derived by modification from certain ingested water-soluble vitamins, and often joined to nucleotide containing a nitrogenous base, e.g., adenine, which participate reversibly in oxidation reduction reactions and take part by transferring energetic electrons removed from some oxidized substrate and delivering them to another molecule which will become a reduced product of the coupled reaction; e.g., Nicotinamide Adenine Dinucleotide (NAD), Nicotinamide Adenine Dinucleotide Phosphate (NADP), Flavin Mono-Nucleotide (FMN), and the Flavin Adenine Dinucleotide (FAD) and the quinones, e.g., Coenzyme Q, found within the lipid membrane in mitochondria. Any of the non-protein organic substances which usually contains a vitamin or mineral and are frequently phosphorylated, which combine with a specific protein, the apoenzyme, to form an active enzyme system by activating the apoenzyme protein, e.g., Adenosine Triphosphate (ATP), Coenzyme A, and many of the electron carriers, e.g., Nicotinamide Adenine Dinucleotide (NAD), Nicotinamide Adenine Dinucleotide Phosphate (NADP), Flavin Mono-Nucleotide (FMN), and the Flavin Adenine Dinucleotide (FAD). 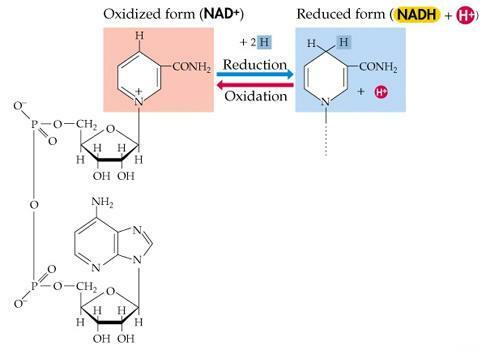 A coenzyme, C21H27N7O14P2, derived from the B vitamin nicotinic acid; an electon carrier and hydrogen carrier occurring in most living cells, and utilized alternately with NADH as an oxidizing or reducing agent in various metabolic processes, e.g., in various steps in the oxidation of glucose. A coenzyme, C27H33N9O15P2, derived from the B vitamin riboflavin; an electon carrier and hydrogen carrier occurring in most living cells, and utilized alternately with FADH as an oxidizing or reducing agent in various metabolic processes, e.g., in certain step in the oxidation of glucose within the citric acid cycle. A series of membrane-bound electron carriers, various quinones, iron-sulfur (FeS) proteins, and cytochromes, located in the inner cristae membrane of mitochondria which receive energetic electrons from various electron carriers, and various related membrane-bound dehydrogenase enzymes, which use that energy in a stepwise series of oxidation reduction reactions to create a proton motive force (chemiosmosis) which pumps hydrogen ions from the matrix of the mitochondria to the intermembrane space which will ultimately be used by ATP Synthetase to generate ATPs. 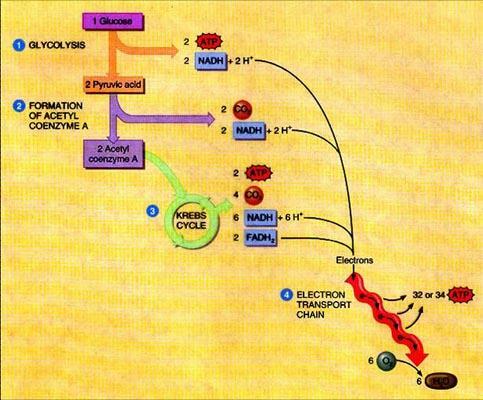 aka - electron transport system, cytochrome chain, cytochrome system. List:the functions of coenzymes in intermediary metabolism. Most are electron transport compounds, metabolic "shuttles" for singles or pairs of energetic electrons (usually with H+ ions traveling with them), which transfer these electrons from substrate molecules to product molecules in enzyme catalyzed oxidation-reduction reactions. List: three specific examples of oxidation-reduction. Sketch and Label:a simplified diagram of the four stages of glucose catabolism. Account for the CO2, electrons (= hydrogens), and ATP extracted or produced in each stage, accounting for the energy yield from one glucose. Any chemical reaction which adds a phosphate group (HPO4-) to an organic molecule; to create the covalent bond, chemical energy of some form must be provided; in human cells, such reactions form two categories: (1) substrate-level and (2) oxidative. Synthesis of high energy phosphate compounds through the enzyme catalyzed (kinases) addition of low energy phosphate ions to an activated substrate, usually an organic molecule; these substrate-level phosphorylation reactions are coupled to energy yielding reactions, e.g., ATP hydrolysis, which occur in the cytoplasm of various cells; an example is the phosphorylation of creatine by ATP, catalyzed by creatine kinase, which occurs in striated muscle tissue. The phosphorylation of adenosine diphosphate (ADP) and synthesis of adenosine triphosphate (ATP) by the complex of oxidation reduction reactions localized in the electron transport chain and ATP synthetase enzymes of the inner christae membranes of the mitochondria which use the energy derived from the oxidation of nutrients such as glucose or fatty acids and delivered to the system by electron transport molecules such as FAD and NAD. Any of various enzymes which catalyze the transfer of a phosphate group from a donor molecule, such as ADP or ATP, to an acceptor molecule; such transfers also often involve the transfer of useful chemical energy with which the cell can do work. An enzyme which catalyzes the covalent linking together of adenosine diphosphate (ADP) and a phosphate ion to form adenosine triphosphate (ATP) by using the energy derived from the oxidation of nutrients such as glucose or fatty acids; the enzyme is located within the inner membrane of the mitochondria and its synthetic activity is directly tied to the proton motive force (chemiosmosis) generated by the electron transport chain which receives energetic electrons from electron carriers NAD and FAD, and uses that energy to pump hydrogen ions from the mitochondrial matrix to the intermembrane space, and when those hydrogen ions follow their concentration gradient back to the matrix, they pass through a channel in this enzyme and provide the immediate source of energy for the synthesis of the ATP. The small organic compound found in muscle cells which serves as a molecular storage depot for chemical energy in the form of high energy phosphate groups; when needed this compound transfers a high energy phosphate group to ADP to form ATP. The theoretical mechanism which explains energy transduction (the proton motive force) in the mitochondrion; as a general mechanism, it is the coupling of one enzyme catalysed reaction to another using the transmembrane flow of an intermediate species; for example, cytochrome oxidase pumps protons across the mitochondrial inner cristae membrane and ATP synthesis is driven by re-entry of protons through the ATP synthesizing protein complex. Phosphorylation, specifically ATP synthesis, induced by radiant sunlight energy during photosynthesis which is carried out by green plants and certain photosyntheitc microorganisms. 1/2 Describe: the electron transport system and its relation to ATP synthetase. 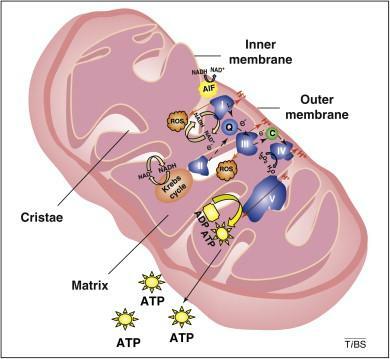 The Electron Transport System (ETS) consists of a series of complexes which are clusters of related oxidation-reduction enzymes and associated membrane-bound electron-transfer compounds which are located as integral proteins within the inner = cristae membrane of the mitochondrion. See the figure below. Complex I is capable of accepting the most energetic pairs of electrons which are carried by NAD+. As these electron pairs are transferred along the series of oxidation-reduction enzymes in the ETS pathway, some useful chemical energy is extracted from them. Because FAD+ carries somewhat less energetic pairs of electrons, those electrons must be delivered to the ETS pathway beyond Complex I and, therefore, somewhat less useful chemical energy can be extracted from them as the complete the path. All of the useful chemical energy extracted from these pairs of energetic electrons is used to power the active transport of hydrogen ions from the matrix in the interior of the mitochondrion to the intermembrane space. See the figure to the right. This extensive hydrogen pumping establishes a powerful electrochemical gradient favoring the movement of the hydrogen ions back across the inner = cristae membrane of the mitochondrion. This gradient, its potential energy, is the proton motive force. 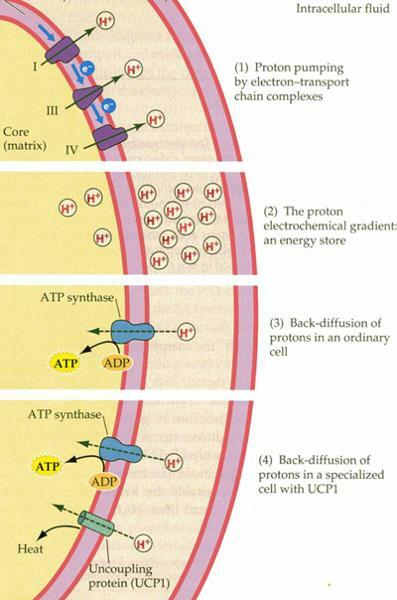 2/2 Describe: the electron transport system and its relation to ATP synthetase. Chemiosmosis is the theoretical mechanism which explains energy transduction (the proton motive force) in the mitochondrion; as a general mechanism, it is the coupling of one enzyme catalysed reaction to another using the transmembrane flow of an intermediate species; for example, cytochrome oxidase pumps protons across the mitochondrial inner cristae membrane and ATP synthesis is driven by re-entry of protons through the ATP synthesizing protein complex. See also the discussion in question 8 above. That period of time in the body during which cell metabolism is primarily fueled by nutrients derived by absorption from the most recent meal; this state is dominated by insulin release from the beta cells of the pancreatic islets in response to hyperglycemia; most cells in the body are responsive targets to insulin and, therefore, in response to insulin arrival, extract glucose from the plasma to use in oxidative pathways to generate ATP; the liver and skeletal muscle responds to insulin in an additional way, storing glucose as glycogen (glycogenosis); most other nutrients from the meal are routed to the liver via the hepatic portal system where they are processed and stored, however, fats are routed to the general circulation via the lacteals and lymphatic drainage, where they are processed and stored as neutral fats (lipogenesis); nervous tissue is not responsive to insulin, but does utilize glucose for fuel use in oxidative pathways to generate ATP; non-nervous tissue will also respond to insulin by taking up and using plasma amino acids for protein synthesis as needed; this time period usually lasts from approximately two hours after the meal was ingested to four hours after the meal was ingested; during this same period, digestive activities are being regulated by the hormones gastrin, secretin, and cholecystokinin, etc. 1/2 Describe: the regulation of nutrient usage for storage and/or energy production in the absorptive state. 2/2 Describe: the regulation of nutrient usage for storage and/or energy production in the absorptive state. Describe: the regulation of nutrient usage for storage and/or energy production in the postabsorptive state. Glucagon, assisted by the group of insulin-antagonists (human growth hormone, thyroid hormones T3 & T4, glucocorticoids (cortisol, cortisone, hydrocortisone, etc. ), and epinephrine = adrenalin, dominates during the post-absorptive state. Nervous tissue, which is unresponsive to insulin, continues to absorb glucose from the blood and using it to fuel oxidative metabolism to generate ATPs. To provide this glucose, the liver catabolizes proteins and lipids to synthesize new glucose molecules, the process of gluconeogenesis, as well as hydrolyzing glycogen, glycogenolysis, to liberate stored glucose. The glucose molecules from these two sources are passed into the blood stream to support the requirements of nervous tissue. 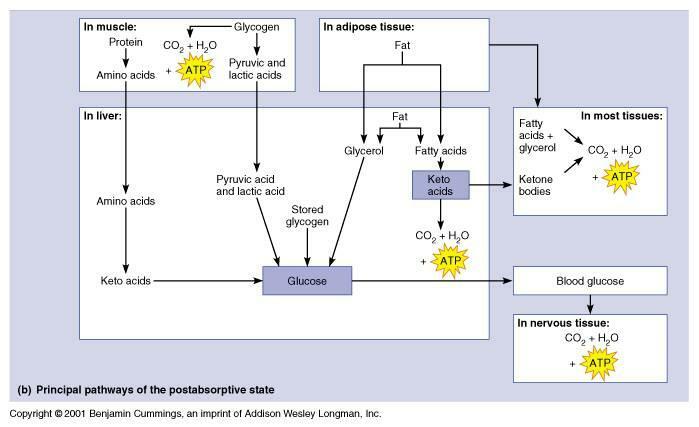 All the other, insulin-responsive tissues of the body shift to the catabolism of neutral fats = triglycerides to fuel oxidative metabolism to generate ATPs. Both fat and protein catabolism generate ketone bodies as by-products which may also serve as fuels for oxidative metabolism to generate ATPs. 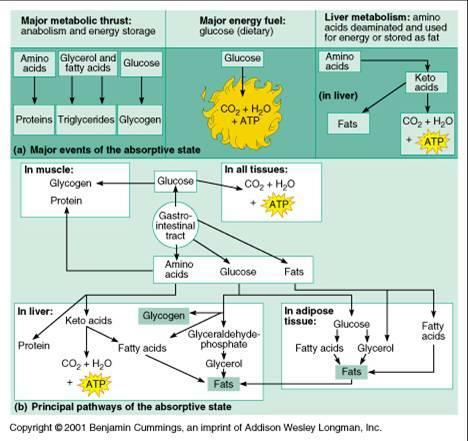 The liver and adipose tissue provide the bulk of the fats used for oxidative metabolism in the post-absorptive state. Describe: describe the time sequence between the absorptive and postabsorptive states during a typical 24 hour day. The time sequences for absorptive and postabsorptive states during a typical 24 hour day are quite variable and depend on the size, content, and number of meals and snacks ingested, as well as the times of ingestion. As a general rule, the body enters the absorptive state approximately two hours after a normal full meal (as opposed to a snack), allowing time for initial digestion in the stomach, and remains in the postabsorptive state for approximately four hours while the nutrients from the meal are being absorbed from the chyme passed to the small intestine. After absorption is nearly complete and after nutrients, especially glucose, from the meal have been transferred to the cells of the various body tissues, then the body enters the post-absorptive state and continues in the post-absorptive state until the next meal is digested by the stomach and passed to the small intestine. thus, the body is typically in the post-absorptive state for the longest continuous period of time during a night's sleep. Individuals who snack frequently may never make a complete shift to the post-absorptive state during waking hours. This is not a problem for their physiology; in fact, it is simply appropriate to their digestive status. The protein hormone secreted by the beta cells of the pancreatic islets of Langerhans; it reduces the concentration of glucose in the blood by targeting the liver to promote glycogenesis, i.e., the formation of glycogen from glucose, and it targets most cells of the body, other than nervous tissue, to take glucose from the blood and use it as metabolic fuel; its deficiency or failure to perform causes the disease diabetes mellitus. The protein hormone secreted by the alpha cells of the pancreatic islets of Langerhans; it is an insulin antagonist, raising the concentration of glucose in the blood by targeting the liver to promote glycogenolysis, i.e., the degradation of glycogen to glucose, and gluconeogenesis, the synthesis of new glucose from non-carbohydrate precursors; it uses cyclic AMP as its second messenger. The group of regulatory substances which oppose the action of insulin (insulin lowers blood glucose levels and is most active during the absorptive state a few hours after a meal has been eaten); these regulatory substances elevate blood glucose levels by encouraging glycogenolysis, gluconeogenesis, and glucose release from the liver and they are most active during the post-absorptive state, from approximately four-five hours after the last meal until one-two hours after the next meal; these substances include the hormones glucagon (pancreas), human growth hormone (anterior pituitary), glucocorticoids (adrenal cortex), epinephrine (adrenal medulla), thyroid hormones (T3 & T4), etc. class of steroid hormones produced by the middle layer of the adrenal cortex, whose release is stimulated by adenohypophyseal ACSH; examples include cortisol, cortisone, and hydrocortisone; the glucocorticoids are involved in carbohydrate, protein, and fat metabolism, and have anti-inflammatory properties; they are insulin antagonists contributing to increasing blood glucose levels and fat catabolism; they play a role in maintaining arterial blood pressue, alter the response of connective tissue to injury, reduce the number of circulating lymphocytes, and play a role in the functioning of the CNS. The main steroid hormone produced by the middle layer of the adrenal cortex, whose release is stimulated by adenohypophyseal ACSH; this glucocorticoid is involved in carbohydrate, protein, and fat metabolism, and has anti-inflammatory properties; it is aninsulin antagonist contributing to increasing blood glucose levels and fat catabolism; it plays a role in maintaining arterial blood pressue, alters the response of connective tissue to injury, reduces the number of circulating lymphocytes, and plays a role in the functioning of the CNS. A catecholamine neurohormone derived from the amino acid tyrosine in the same pathway which produces norepinephrine, from which epinephrine is derived; it is released by the adrenal medulla and interacts with all target cells which have adrenergic receptors to ready the body for increased skeletal muscular activity or fight-or-flight emergencies. A protein hormone secreted by the anterior lobe of the pituitary gland/adenohypophysis which targets most body tissues, particularly the liver, skeletal muscle, bone and cartilage, and promotes growth of the body, especially by stimulating release of somatomedins from the liver abd other tissues, and which stimulates protein catabolism; it is an insulin antagonist contributing to increasing blood glucose levels and fat catabolism. The ventromedial region of the hypothalamus which is activated by hyperglycemia and by stretching sensations from the stomach to act to inhibit the feeding center of the hypothalamus, thus inhibiting food intake. List:the factors which stimulate the hunger (feeding) center of the hypothalamus. List: the factors which stimulate the satiety center of the hypothalamus. List: 5 hormones which can be termed "insulin antagonists."